Since we first published our review on the health benefits of owning a Himalayan pink salt lamp, these little beauties have quickly become our favorite natural health gadget of all time. And with their rise in popularity, sales of Himalayan salt lamps have been booming! Unfortunately, this increase in demand has also created a perfect opportunity for less-than-honest individuals to profit by selling cheaply manufactured salt lamp counterfeits. While it may not always be obvious, there are a few easy ways to tell if your Himalayan salt lamp is a fake. Read on to learn the seven signs to look out for and make sure that you’re getting what you paid for – a genuine Himalayan pink salt lamp with all of the health benefits that come with it! Don’t currently own a salt lamp but want to make sure yours is the real deal? Here at Natural Living Ideas, we’ve tested some of the most popular brands and strongly recommend this Levoit Kana Himalayan Salt Lamp. It is backed with hundreds of positive reviews and Levoit are widely regarded as the best suppliers of quality salt lamps and at the fairest price. Himalayan salt crystals typically range in color from medium pink to dark orange. Also, because the salt is full of various different minerals, light emanating from the lamp will be muted and uneven. 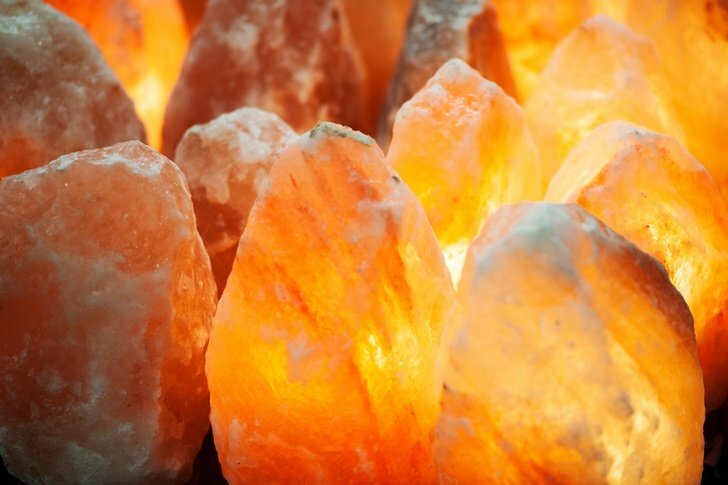 For these reasons, the average salt lamp emits only a soft warm glow. If your lamp is small but gives off enough light to fully illuminate the room that it is placed in, this is a fairly good sign that your Himalayan salt lamp is a fake. As previously stated, Himalayan salt crystals usually display a warm pinkish or orange hue. While white Himalayan salt does exist, it is rare and highly sought after. Thus genuine white Himalayan salt lamps will be much more expensive than the common colored varieties. If you find a lamp which sports a white salt crystal, but the price isn’t significantly higher than other Himalayan pink salt lamps, this another sure sign that the product isn’t genuine Himalayan pink salt. So if you live in a particularly moist region and your lamp has never done it, this is a pretty good sign that your Himalayan pink salt lamp is a fake. Another big problem inherent to genuine Himalayan pink salt lamps is that they tend to be rather fragile. In fact, it is not uncommon for lamps to be damaged during shipping due to poor packaging or improper handling. Accidentally dropping or bumping your HPS lamp into another solid object is a sure fire way to ding or chip away pieces of the salt crystal. If you’ve done either of these things (or anything else that would otherwise damage a fragile chunk of Himalayan pink salt) and your lamp held up exceptionally well, this is another good sign that it may be a fake. Suppliers of genuine Himalayan pink salt products understand that Himalayan pink salt is a fragile material. As such, genuine HPS salt lamp vendors usually offer flexible and convenient return policies. If you’re about to purchase a new lamp and the supplier is super strict about returns, buyer beware! If they are selling counterfeit Himalayan salt lamps, it’s highly likely that they’re hoping you won’t discover the truth until it’s too late to return the product. As previously stated, in some cases real Himalayan pink salt lamps don’t even survive the shipping process due to the fragile nature of the materials! So even if they are selling genuine HPS salt lamps, you should still be wary of any merchant who isn’t flexible about refunds or exchanges. Despite all of the research and firsthand accounts of how Himalayan pink salt lamps have improved the lives of people around the globe, there are still a lot of skeptics out there. From easing asthma and allergy symptoms to increasing energy and counteracting Seasonal Affective Disorder, the science behind HPS lamps is the real deal. You can read all about it in 10 Reasons To Have A Himalayan Salt Lamp In Every Room Of Your Home. If you followed the sizing guidelines (listed at the end of the above-linked article) but your lamp doesn’t seem to be providing any of the health benefits as it should, it’s possible that your lamp may be a fake. Real Himalayan pink salt is obtained from deep underground in the mines of Khewra, Pakistan. Khewra is located on the western edge of the Himalayan mountains and it is the only place where true Himalayan pink salt is found. So if you aren’t sure about the authenticity of your lamp, you can always inquire about the salt crystal’s country of origin to determine if your lamp is a fake or the real deal. (Just remember that some manufacturers may list country of origin as where the lamp was assembled, so be sure to specify. As you can see, buying a Himalayan salt lamp is not always an easy process and is riddled with shady selling tactics and poor quality products. Luckily, we’ve tested the best and discovered this Levoit Kana Himalayan Salt Lamp with Touch Dimmer Switch to be the best. It’s backed up with hundreds of positive Amazon reviews and protected by Amazon’s returns policy if any damage should occur during shipping. You can get it here and have it in your home in just a few days. Alternatively, if you’d prefer a stainless steel base and are prepared to pay a little extra for the privilege, then this beautiful Levoit Kyra Salt Lamp with Stainless Steel Base is for you. If you haven’t already read it (or even if you have and just want to experience the magic again) be sure to read our article: 10 Reasons Every Home Should Have A Himalayan Salt Lamp. Lamp didn’t come with a manual? No worries! We welcome you to take advantage of all of our experience (and mishaps!) with our Himalayan Salt Lamp Use & Care Guide. Included are 10 great tips with a side of humor to help you give your lamp the long and happy life it deserves. Then for something a little different, check out these 10 Himalayan Wonders With Extraordinary Health Benefits to learn a few more tips on health, happiness and longevity from some of the longest-lived people on the planet!